Matt is inteviewing Nadjya Ghausi, Vice President of Marketing for Prezi. They'll take the topic of conversational sales presentations further. How a new approach to pitches can transform your engagement and results. "They will also be touching on the recent study from Harvard University researchers, which sought to answer the question, "Does a presentation's medium affect its message?" The full content of that study can be found here." Tune in for this conversation of ideas. Prezi would like to give you a gift for listening - their Conversational Presenting eBook. 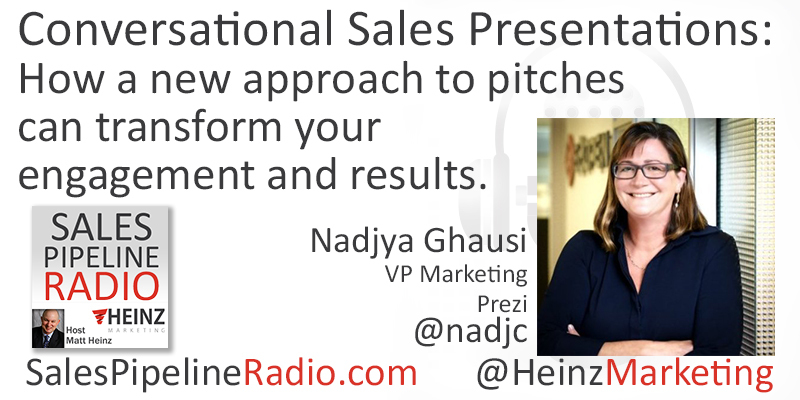 As Prezi's VP of Marketing, Nadjya loves building all-star teams with the power to drive global market leadership. One of the things she values most at Prezi is the ability to combine technology, data, and innovative storytelling to develop an authentic brand.